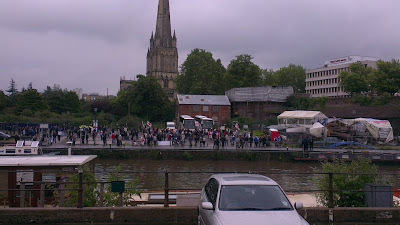 Today’s EDL demo in Bristol has generated a great deal of advance publicity, almost all of it negative given the wide variety of the protest movement’s opponents, and the backing that the latter receive from the mass media, owing to NUJ diktat that makes it obligatory for journalists to report the EDL in a negative light. Whereas the EDL declares itself to oppose Islamist terror, Islamism and Islamisation, its detractors assert that these declared aims are based upon a paranoiac mindset lacking a solid basis in contemporary reality, and are little more than a pretext for giving vent to a form of crude ‘racism’. Recent events however, should help the reader to disentangle claim from counterclaim, and to identify which of the perspectives is more rooted in reality. This week, two members of the EDL involved in the planning of the Bristol demo have been issued with Osman warnings by Avon and Somerset Police, which means that intelligence has been received relating to credible death threats against them, but the police do not have sufficient evidence to arrest the suspect(s). The background of those who have issued the threats is unclear, but taking into account the violent language and imagery employed by some of the EDL’s Trotskyist and anarchist (the self-styled ‘anti-fascist’) opponents, they rather than Islamists could well be the source. Besides these threats, there have been the recent arrests of six Muslim suspects relating to the alleged Dewsbury Bomb Plot, the object of which was said to be the EDL’s last demonstration in that town on Saturday 30 June. Clearly therefore, for all the mass media’s talk of the EDL being ‘hatemongers’ and violent yobs, these death threats and this intercepted bomb plot highlight a rather different reality, and underscore the validity of the EDL’s stance. Avon and Somerset Police have taken the rational decision of ensuring that the counter-protest mounted by Trotskyist front group 'We are Bristol' will now be held in a different location and at a different time to the EDL demo, presumably having taken into account the experience of previous such protests when the violent intent and proclivities of many of the counter-demonstrators led to attacks upon the police as well as upon the EDL. 'We are Bristol' will now have to assemble in Castle Park instead. Unsurprisingly, now that the police have wisely removed their opportunity to seek violent confrontation, 'We are Bristol' yesterday released a disgruntled press statement voicing their dissatisfaction with this decision. We . . . [requested] them not to confuse and entice Muslim youth to join their counter protest. They have not proactively engaged with the Muslim community leadership so we are not assured on any matters whatsoever. At the last couple of EDL demos there has been a notable absence of Muslim counter-protesters, and the number of self-styled 'anti-fascists' has been small. Clearly, Muslims in general have awoken to the fact that the Trotskyist Left has been attempting to manipulate them for their own 'revolutionary' political ends, and have decided that they are no longer going to be duped. The question that many will be asking today, is what impact will these recent revelations have upon turnout at the EDL’s Bristol demo? Will they serve to galvanise its supporters and increase their numbers, or to deter people from attending? The answer will become apparent as the day progresses, and will unfold below as news becomes available, drawn from a variety of sources including both pro- and anti-EDL sites and comments, as well as official releases by the Avon and Somerset Police. Please return for ‘live’ updates throughout the day. It is likely that the first available video footage will be posted by early evening. Despite the police moving the counter-demonstration to Castle Park, according to a tweet it appears that at least some within the anarchist contingent of 'We are Bristol' are intent upon meeting at 'The Fountains' in Bristol City Centre at 11.00am. As the EDL demo is not due to start until 1.00pm and the opposition officially-sanctioned protest started at 11.00am, it is not yet (as of 12.07) clear as to the likely turnout for the EDL. According to some of their opponents, the estimates of the total number of counter-protesters varies wildly, being 30, 150 or 300 according to your taste. As with all demos, it is safe to discount the highest figure given that it is not from a neutral source. This is Bristol reports that circa 250 counter-demonstrators had gathered in the centre of Bristol, and that a number of them appeared to be heading off to Redcliffe Bridge in an effort to block the EDL march.One tweet reports that Martin Smith of UAF has been arrested.The counter-protesters are claiming some rather high figures for their demo - up to 2,000 people - whilst asserting that the EDL turnout has been very low. As yet, there are no neutral or sympathetic sources providing estimates of the number of EDL supporters, with one hostile tweet claiming that there were 150. From the first of the pictures below, EDL numbers are not currently looking healthy. As of 12:56, one tweet stated that the EDL were claiming that 500 supporters had turned up, whereas in the opinion of the tweeter, the figure was closer to 300. This is Bristol opts for a figure of 500, BBC Points West for 250. If this does prove to be the case, the size of the demo appears to be very much in line with that witnessed in Dewsbury a fortnight ago. Posters welcoming the EDL to Bristol are said to have been seen going up in the city centre. By 3.30 the protesters were boarding their coaches to head home. However, at 3.35 Emily Koch of This is Bristol posted a tweet stating that rival protesters were not only yelling abuse at each other, but also throwing rocks. A very ugly scene indeed. Riot police had been deployed in Redcliffe by 3.48. A tweet posted at 4.03 claimed that UAF protesters had blocked routes in Bristol in an attempt to stop EDL coaches from leaving the city. It seems that some 'antifa' protesters have clashed with police, upturned wheelie bins and set light to rubbish in the road. More on the unrest can be accessed here. 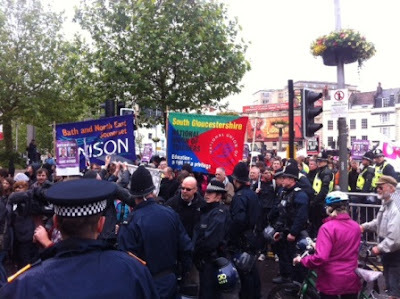 Avon and Somerset Police issued a statement in which they expressed satisfaction that the majority of demonstrators "were well behaved, in good spirits and caused no problems to the local community." According to their estimates, the EDL attracted some 300 protesters, whereas the counter-protest numbered approximately 500. A video of the EDL march can be seen here. thanks for this i support the EDL in their aims.